(Nanowerk News) The emerging field of molecular electronics could take our definition of portable to the next level, enabling the construction of tiny circuits from molecular components. In these highly efficient devices, individual molecules would take on the roles currently played by comparatively-bulky wires, resistors and transistors. A team of researchers from five Japanese and Taiwanese universities has identified a potential candidate for use in small-scale electronics: a molecule called picene. In a paper published September 16 in The Journal of Chemical Physics ("Scanning tunneling microscopy/spectroscopy of picene thin films formed on Ag(111)"), they characterize the structural and electronic properties of a thin layer of picene on a silver surface, demonstrating the molecule's potential for electronic applications. Picene's sister molecule, pentacene, has been widely studied because of its high carrier mobility—its ability to quickly transmit electrons, a critical property for nanoscale electronics. But pentacene, made of five benzene molecules joined in a line, breaks down under normal environmental conditions. Enter picene, in which these same five benzene rings are instead bonded together in a W shape. This simple structural change alters some of the molecule's other properties: Picene retains pentacene's high carrier mobility, but is more chemically stable and therefore better suited to practical applications. To test picene's properties when juxtaposed with a metal, as it would be in an electronic device, the researchers deposited a single layer of picene molecules onto a piece of silver. 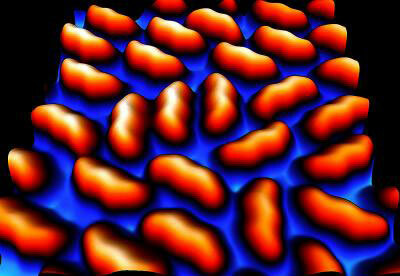 Then, they used scanning tunneling microscopy, an imaging technique that can visualize surfaces at the atomic level, to closely examine the interface between the picene and the silver. Though previous studies had shown a strong interaction between pentacene and metal surfaces, "we found that the zigzag-shaped picene basically just sits on the silver," said University of Tokyo researcher Yukio Hasegawa. Interactions between molecules can alter their shape and therefore their behavior, but picene's weak connection to the silver surface left its properties intact. "The weak interaction is advantageous for molecular [electronics] applications because the modification of the properties of molecular thin film by the presence of the [silver] is negligible and therefore [the] original properties of the molecule can be preserved very close to the interface," said Hasegawa. A successful circuit requires a strong connection between the electronic components—if a wire is frayed, electrons can't flow. According to Hasegawa, picene's weak interactions with the silver allow it to deposit directly on the surface without a stabilizing layer of molecules between, a quality he said is "essential for achieving high-quality contact with metal electrodes." Because picene displays its high carrier mobility when exposed to oxygen, the researchers hope to investigate its properties under varying levels of oxygen exposure in order to elucidate a molecular mechanism behind the behavior.